German Shepherd Breeder. We believe that the way we maintain our German Shepherds reflects not only on their development and happiness but on us as people. Once you decide that the highly intelligent, noble, and loyal German Shepherd Dog is right for you and your family, it is time to take an honest look at dog ownership. Please read this page before purchase. Below you will find information about and recommendations for German Shepherd ownership. 1- FINANCIAL COMMITMENT- It is estimated that it will cost $3,000 per year to maintain a large breed dog in vet bills, grooming supplies, and food. If you hunt or have a neighbor who hunts, that amount could be lower. I currently buy my meat from small grass-fed ranches. I order in bulk so that the shipping is free and some ranches offer additional savings for bulk orders. I buy form Rain Crow Ranch, US Wellness meats, and Slanker's Grass Fed Meats. I also like Reel Raw. Their meals are premixed so it is as easy as feeding kibble. We recommend that you feed meat that is organic. Grocery store or factory farmed meat may contain harmful bacteria and antibiotic residue. If you do choose to feed dry dog food please choose a high-quality grain-free product. Easy Raw is a dehydrated raw dog that is very easy to use and inexpensive. Our vet bills consist of hip x-rays or rare mishaps. Our dogs are very healthy--on the diet we feed--so veterinarian bills are rare. If you feed processed dog food, you will probably spend more time and money at the vet. Processed dog food may appear to save money but in the long-run it does not. Many German Shepherd's have sensitive digestive systems. I believe that processed food, chemicals, and food colors can trigger allergies in your dog, which can lead to lowered immunity and vet visits. Food allergies can also trigger brain symptoms. Neurotic behaviors, anxiety, and aggression may be triggered by food reactions. A natural diet has many benefits for your dog. Read, Dr. Becker's Real Food for Healthy Dogs and Cats. 2- PUPPIES- Puppies are fairly labor intensive while they learn to live in their new home environment. Puppies may need to be taken outside one time per night until they are four to five months old. Puppies really do not have complete bladder and bowel control until they are eight months old. You have to stay on top of housebreaking so your pup can have a successful outcome. If waking up one to two times per night is not for you, you may want to consider a young, trained adult. The majority of our German Shepherds have above average intelligence. When making a decision to purchase one of our dogs,you will also want to consider their unique needs. Tre'Good puppies are not happy being left in the yard and treated like "dogs." An intelligent German Shepherd is estimated to have the intelligence, on many levels, of a five to eight year old child. That information should give you pause. These puppies are capable of developing a sophisticated level of communication with you. They will learn to understand what you are communicating to them but they will also expect you to hear what they have to "say." If you see dog ownership as a one way street--dog does what you say and has nothing to offer you-- then your Tre'Good pup will be miserable. Developing your canine language skills and the educational needs of your pup is a must. If you treat your pups life with respect and provide him/her educational opportunities, the potential of your dog and your relationship will grow exponentially. By giving your pup a fulfilling life and opportunities to increase his/her intelligence you will have a relationship far beyond the average dog/ human experience. If you leave your pup in the yard with an occasional walk your dog will suffer and never reach his/her full potential. All of our pups come with basic language development and training. We also teach communication skills during our Super Puppy course. We are also finishing a series of communication development and training skills videos that will be added to our website soon. If you are committed to the time needed to learn a new way of looking at dog ownership you will be thrilled with one of our dogs. If you want a yard dog or an occasional hiking buddy one of these pups may not be a perfect fit for your family. On Talking Terms With Dogs is a great book to begin your odyssey into dog communication. Recognizing the most basic body language communications from your dog and honoring those signals will greatly deepen your dogs notice and respect for you. Dogs tend to not focus on humans who can't hear them..
3- EXERCISE- German Shepherds need exercise. The amount depends on the energy level of your dog. Dogs are crepuscular, meaning they have two activity peaks naturally during the day. One is in the morning and one is in the evening. Older dogs may sleep all night and during the middle of the day. Young dogs will have noticeable peaks during the morning and evening but will also be awake during the day, exhibiting lower energy than at peak times. Drive is usually used to describe energy levels but is actually a motivation for something. There is prey drive, food drive, rank drive, pack drive, herding drive, guard drive, play drive, defense drive and others. All dogs have drives. Each dog will exhibit drives that are high and low depending on the personality makeup of the specific dog. A dog can have a high prey drive, low pack drive, medium rank drive, and high defense or guard drive. How the drives meld together is different for each dog. Energy level is a different consideration. The high energy dog has abundant energy to invest into its drives but s/he also puts that energy into all aspects of life. 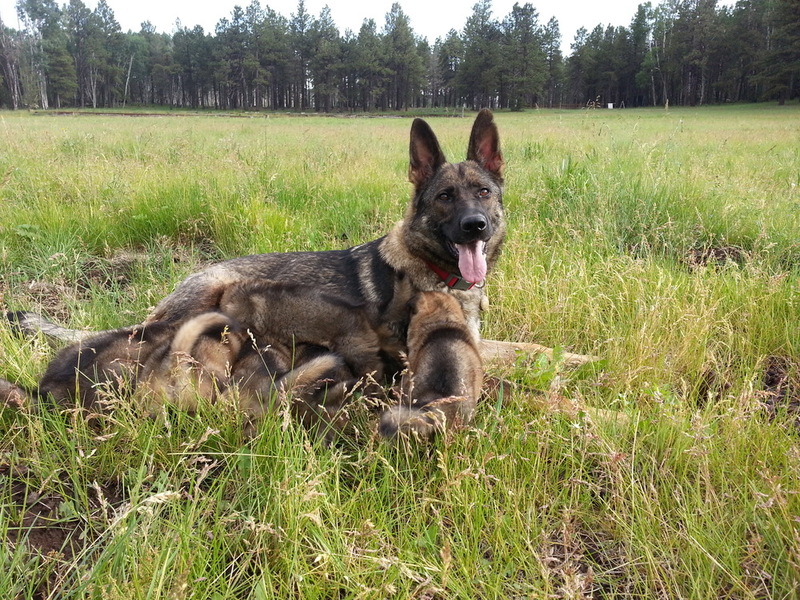 Dogs with high energy and prey drive are excellent Schutzhund prospects. The high prey drive dog is easy to train for an experienced handler because it will do almost anything for the prey object "its obsession," usually a ball or tug. But, the same highly regarded Schutzhund prospect does not easily fit into the typical family as a companion. A medium energy dog can have a high prey drive and be easily trained, but is also easier to live with in a family situation. Many lower energy dogs have high food drives which also makes them easy to train and they fit in well with less active families. High drive/energy dogs have a tremendous amount of energy and may be considered hyperactive. These dogs need runs, hikes, or bike rides twice daily. A game of fetch here and there will also help. High drive/energy dogs do best in sport, agility, herding, and as working police dogs. Athletic people may also enjoy these dogs as exercise buddies. Please watch this video. High drive dogs are often sired by Schutzund titled parents. Dogs that achieve Schutzund titles posses high energy/drive needed to perform the flashy obedience seen on the Schutzund field. Unfortunately, Schutzund obedience is often confined to the ring and does not transfer well to the street. We have become fixated on the belief that Schutzund titled parents guarantees an excellent German Shepherd. This may be true if you are looking for a top sport, police or military working dog. If on the other hand, you are looking for a natural, protection, family dog, the titles may be a hindrance. High drive dogs are amazing if you know what you are getting into and you have a focus for their lives. If you want a top sport dog, there are several kennels breeding them. if you want a family dog, high level titles may not give you the dog you seek. German Shepherds are one of the top dogs in shelters and rescues today. If a breeder tells you their high-drive puppy will make a great family pet, be cautious! Free time in the backyard, no matter how large the yard, does not equate to exercise. Your German Shepherd wants to be active "with you." They need their physical exercise to include you or a job they are doing with you. A medium energy dog will also need morning and evening exercise but you can cut back on the mileage. A good game of fetch also counts for exercise. The Chuck-it gun is a great option if you don't like to throw balls. A low energy dog may be happy with walks, a trip to the dog park, or a good game of fetch. Treadmills are an excellent option for exercising your dog when you don't have the time to take him/her out or when you are under the weather. In fact, every German Shepherd owner should have one as a back-up for those days when outdoor exercise is out of the question. During a busy week, you can place your dog on the treadmill while you are getting ready for work. When you leave, you can place a calm and relaxed dog in his/her safe area for the day. 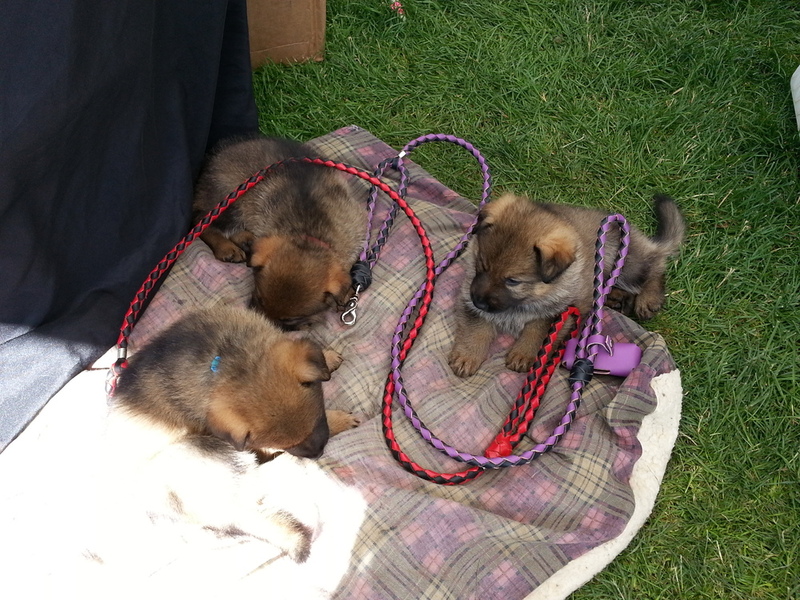 4- SOCIALIZATION is a must for German Shepherds. Be prepared to take your dog with you to as many places as possible. Your dog will still be naturally protective, but, it is vital that your dog accept people you befriend. Many businesses are now happy to let well behaved, trained dogs into their stores. German Shepherds are large dogs and must be obedience trained for your control. Dog obedience classes are also a great way to get your dog out into the world meeting new people and dogs. 5- COMPANIONSHIP- German Shepherds bond strongly with their people. They need time and companionship from their family. They are best suited to families where one person works from home. If they can go to work with you, all the better. If you have to leave your dog home during the day, plan on coming home at lunch for a little play time. A good doggie daycare or dog walker is also an option. Puppies and young dogs should be confined to safe areas while you are gone during the day. The area of the house they are allowed to be in can increase as they mature over a period of a year or two. Hiding Kongs filled with treats in their safe area can help stave off boredom. Puzzle feeders can also be helpful. A constant rotation of toys, food treats, and puzzle feeders can greatly ease boredom while you are away from home. If you must leave your dog home alone for long periods of time, be sure to exercise him/her before you leave. 6- INTELLIGENCE- Our line of German Shepherds is bred with an emphasis on developing and increasing the intelligence of the German Shepherd. Our dogs are very bright and need mental stimulation whether high or low energy. Your German Shepherd needs to follow your leadership or he/she will be busy trying to run your life. Obedience classes will teach your dog to follow your leadership while also providing needed mental stimulation. A dog who follows, instead of leads, is happier and less stressed than a dog who is calling the shots and trying to protect his/her pack in the human world. Consider a job you and your dog may enjoy together. Our dogs excel at agility and obedience. Many are candidates for therapy, service, or search and rescue work. Be prepared to play brain games with your dog if he/she does not have a job. There are many books on the subject: Brain Games for Dogs: Fun Ways to Build a Strong Bond With Your Dog and Provide It With Vital Mental Stimulation. Claire Arrowsmith, and, Mental Activation: Ways to Stimulate Your Dogs Brain and Avoid Boredom. Anders Hallgren. ALL OF OUR PUPPIES COME WITH A FREE SIX WEEK SUPER PUPPY CLASS. I have owned only two dogs that died of parvo. Both were shown in conformation and were fully vaccinated on the usual yearly schedule. They caught Parvo at a show despite the vaccine protocol. I brought the dogs home before I knew they were sick. None of the females nor the two litters of young pups I had at home were vaccinated. The moms and pups became lethargic and ate light or not at all for three days, but they all recovered completely without intervention. My two vaccinated dogs died at the veterinarian. Medication and I.V. 's could not save them. I can only guess why, but the vaccine schedule may have reduced their natural immune function. That is when I began to question the safety and usefulness of the yearly schedule. I remain skeptical of vaccinations. I have found that the raw food diet enables our dogs immune systems to fight illness and disease. If you want a healthy dog that doesn't need constant trips to the vet, feed raw and avoid unnecessary vaccinations. Make your own judgment. If you need to leave your dog in a kennel or a doggie daycare you can have your veterinarian run an "antibody titre level" blood test. The test will show if your dog is producing antibodies to the illnesses it was vaccinated against. A blood test positive for antibodies will stand in place of a regular vaccination schedule for kennels and day cares. A German Shepherd Dog is not a dog that gets up in the morning and is content lying around all day. He was blessed with one of the dog’s kingdoms most intelligent minds. If he’s not challenged on a daily basis to use the intelligence that was bestowed on him, he grows restless and weary. He was not born to be a lap dog sitting on the couch passing the time away. He was born to work, herd, protect and to learn. If he’s not given something constructive to do, then he can become very destructive because he becomes bored. The German Shepherd Dog is the most happy when he’s being trained serving man in some capacity where his mind is being stimulated. An idle mind is not a happy mind. Genetics has dictated that his mind be utilized to fulfill the destiny of his heritage. What a pity for this breed or for any breed to be left in a dog run all day with nothing to keep him company but the enclosure of a cage. For those who say he’s just a dog, then they’ve missed the whole point of dog ownership in the first place. A dog can teach man many things about living all of which can be the most simplistic in nature. The dog lets man be his most silly self without the fear of being judged. There are many a time when a dog owner finds himself enjoying a hearty "belly laugh" because of the antics of his animals. Many a dog has filled someone’s lonely hours when the shadows of the night seem to swallow one’s thoughts. Sometimes it seems like the dog is the only friend man has when he finds himself struggling in the darkest throes of his life. The German Shepherd is not a breed for everyone. This is a noble, proud breed. He’s not lazy, and he’s not content being left alone. This is a breed that thrives when his intelligence is being stimulated. This is a breed that is the happiest when he’s a companion to his master. Each day he awakens, his spirit is rejuvenated with the anticipation of being with his master and serving him in some capacity. He looks forward to a walk, a training lesson or a game of fetch or a pat on the head; anything but lying on the cold hard cement floor of his run. If the only time a German Shepherd Dog is taken out of his run is to be bred or to go to a dog show, then man has done a disservice to "The King of Dogs" and is not worthy of his ownership. It’s a challenge owning this breed. Man needs to ask himself if he’s up to that challenge and with it the responsibility and pride that comes with owning an animal with this much intelligence, this much heart and courage, and this much devotion to love his master even if he does leave him in the run for his entire life. What a sorrowful plight then for a German Shepherd Dog to never have realized its potential…… to never experience what it felt like to herd sheep in a wide open field……or never know what it felt like to be a hero by rescuing a drowning child from an aggressive river…… to never feel the grateful touch of an elderly person in a nursing home……or never help contribute to a better quality of life to a blind man. Therefore, each and every German Shepherd; and especially future show or breeding stock should experience what most of its litter mates have already experienced. They too should know what it’s like to be someone’s beloved pet and not just a commodity. The German Shepherd Dog was born for greatness. Anything less, is not a German Shepherd. To have his genetic destiny stunted is a sin against his creator because a German Shepherd Dog’s mind is a terrible thing to waste.